Thanks everybody for the kind words in response to the changes that I announced on Monday. So, instead of saying goodbye, I will continue writing 🙂 Nevertheless, today's word is "parting": "afscheid" in Dutch. It applies to situations where you say goodbye to somebody forever, or for a long period of time. When two people bid each other farewell, in Dutch we say 'ze nemen afscheid van elkaar'. For those in the Netherlands who listen to Dutch radio stations, a popular song at the moment is "Afscheid" by Dutch singer Glennis Grace. It's her first number 1 hit in the Netherlands and the breakthrough that many feel she deserved. The original version of "Afscheid" is by the band Volumia with singer Xander de Buisonjé. Let's learn more about "Afscheid" by watching the video of Glennis Grace performing in the TV show "De beste zangers van Nederland" (Holland's best singers). I've provided a translation to help you understand the Dutch. This entry was posted in Dutch songs, Dutch word of the day, DWOTD 1.0, Vocabulary Basic and tagged afscheid, afscheid nemen, Glennis Grace, Volumia, Xander de Buisonjé by Sander. Bookmark the permalink. Anyone else notice the guy sitting in the white seats that kept yelling “yeah” during her performance? Sander, I am so happy that you have decided to keep writing the blog. 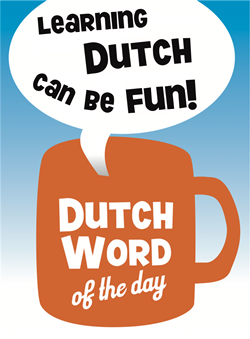 I have just begun my studies in Dutch, and it has become a cornerstone in my studies. I found you page a week ago and was crestfallen to hear you may stop. I am glad that your fans have encouraged you to continue. Count me among them, with gratitude! I’ve only just found this site!. Could i suggest another thing, for people who, like me, have not been here for the last 5 years? Re-post (starting at the beginning!) a new word every day? You could create feeds/tags for new posts, reposts and both? Sander, I just found your site as well. Please keep up the work. I find it very helpful. I particularly like the audio .mp3 of the words/phrases and the literal translations. More literal translations would be very nice, as they show how the different thoughts are structured across the languages, like the literal translation of “now or never”/”do or die” to “on top or under” helps to remember how one conveys that thought. Thanks. Hello Dr. Hess – As a matter of fact, I always try to provide a translation which is as close as possible to Dutch, since the whole purpose is to show how Dutch works. Sometimes it doesn’t work of course, in which case I provide the literal translation in addition to the regular translation. Thankyou so much for posting this! What an amazing voice… I wonder if she will ever sing in English to break into the world market…or maybe she could bring Dutch to the world!